White Lies considers African-American bodies as the site of cultural debates over a contested "white religion" in the United States. Rooting his analysis in the work of W.E.B. DuBois and James Baldwin, Christopher Driscoll traces the shifting definitions of "white religion" from the nineteenth century up to the death of Michael Brown and other racial controversies of the present day. He engages both modern philosophers and popular imagery to isolate the instabilities central to a "white religion," including the inadequacy of this framing concept as a way of describing and processing death. The book will be of interest to students and scholars interested in African-American Religion, philosophy and race, and Whiteness Studies. "Throughout American history, most white folk have refused to acknowledge the depth, breadth, and power of whiteness. But not Chris Driscoll. In this provocative and searching book, he looks into the heart of whiteness and finds what so many women and men of color have seen before: pain, death, and deception. Part history, part philosophy, and part theology, White Lies contains loads of truth." "In this provocative new book, Driscoll 'sights, cites, and sites' white religion, drawing it into focus in an effort better to address the ways that whiteness functions religiously in America today. 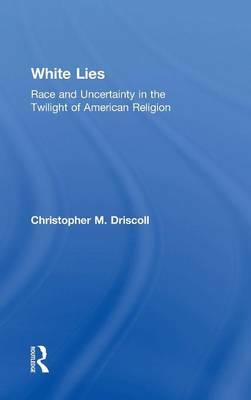 Suggesting that 'white religion' is a racially/religiously inflected inability to accept human limits, Driscoll mines existentialist, anthropological, and narrative sources to point us away from a paralytic cultural fear of death, toward a hopeful twilight of the (white) gods." "Responding to the growing visibility of mainstream violence directed to black bodies, White Lies performs a high-wire dance between philosophy and anthropology, God and idol, whiteness and its own possible 'dying' in the fraught space of America." "White lies is a brilliant thought-provoking interruption of our god-idols - critical theory at its best, empowering us to go beyond white religion."